A successful seminar , congratulations Ken! Ken Feeley, the head of our Lab, gave a well received and incredibly successful departmental seminar today as he begins the process of tenure application (picture above). 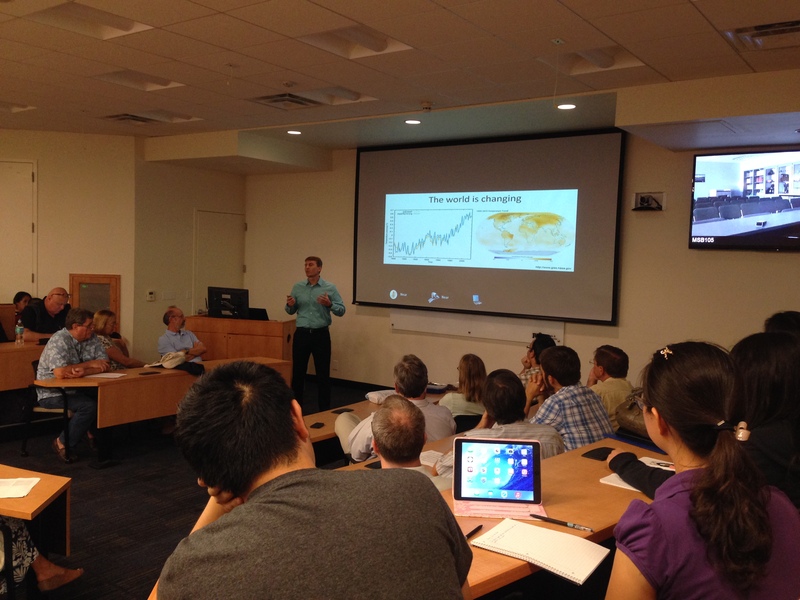 Ken discussed his past, present and future research on how plants will respond to modern climate change. He primarily discussed our Lab’s research on long-term vegetation plots in the Peruvian Andes, summarized past findings and presented the exciting directions our future research will be going in! Congrats Ken! Work from our team has showed provided evidence that cloudforest tree species from the Andes and from Costa Rica are shifting their distribution upslope, possibly in response to increasing temperatures. For the Andes, we conducted a follow-up study where we predicted the future population sizes, and thus extinction vulnerabilities, of the migrating species under different warming scenarios and sets of competing assumptions. What this exercise clearly showed is that the future of these cloudforest species depends very much on what happens at the upper limit of their distributions – the treeline*. If species are able to migrate upslope and extend their ranges past the current treeline to occupy the parts of the puna (high elevation grassland habitat above treeline sometime referred to as paramo in other parts of the Andes) that become climatically suitable, then we predict that their population sizes may actually increase. The reason for the increase, and apparent benefit of climate change, is simply that the cross section of the Andes is more trapezoidal than triangular; consequently, as species migrate up off the steep slopes, past treeline and onto the high plateau (altiplano), the amount of land area that they can occupy increases. 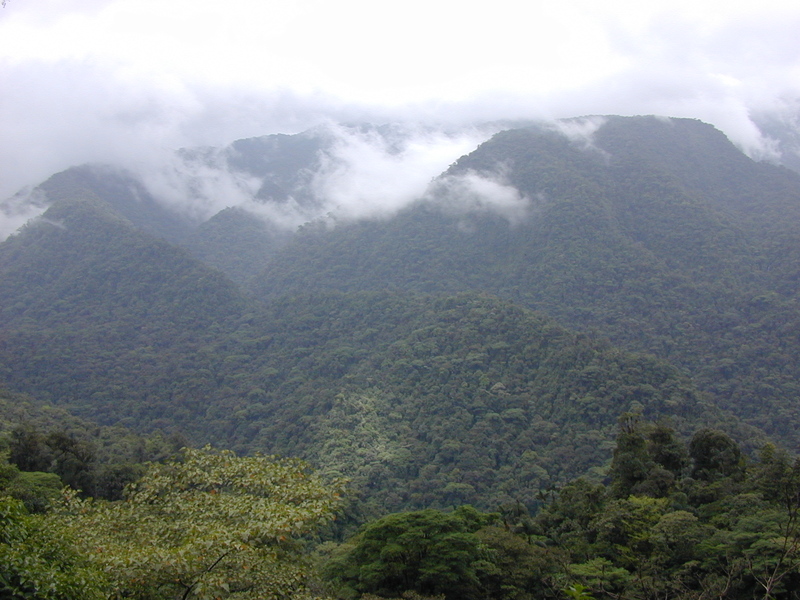 In contrast to this relatively rosy scenario, if the treeline remains where it currently is and doesn’t shift upslope with warming (e.g., due to cattle grazing and human activities above the treeline), we predict that all cloudforest species will suffer massive decreases in available habitat area and their population sizes (and hence increases in their risks of extinction) as the lower elevations become ‘too hot’ but they are unable to occupy the ‘just right’ temperatures at higher elevations. So we need to know, “will treeline move with warming?” Well, we now have several decades of climate change behind us so we can look back and ask if treeline has moved or not in response to the 0.5-1oC of warming that the Andes have already experienced over the last several decades. 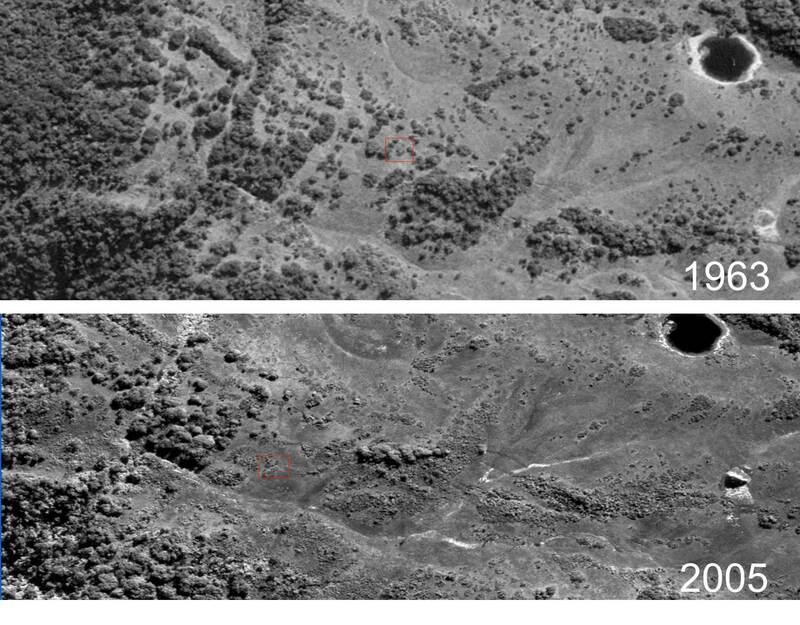 As part of his dissertation research, our colleague, Przemek Zelazowski, looked at Landsat images collected over the Andes from 1970 to 2000. Due to warming, treeline should have shifted upslope between 90 and 140 vertical meters over this time period. He found zero change. Yes, treeline moved up in some places, but in other places it moved down and the modal change, by far, was zero zero zero. Now, a new study by David Lutz et al. conducts a similar analysis but using much higher-resolution imagery of the areas around Manu National Park where my team works. Over the 4 decades for which they had imagery, they found that 80% of the treelines that they looked at showed zero net change, and the average change across all treelines they looked at was an upslope shift of 0.14 vertical meters per year. This is in the right direction, but it is just 1% the rate that was required to keep pace with concurrent warming. Treeline has not moved in response to past warming. It is doubtful that it will move in response to future warming. 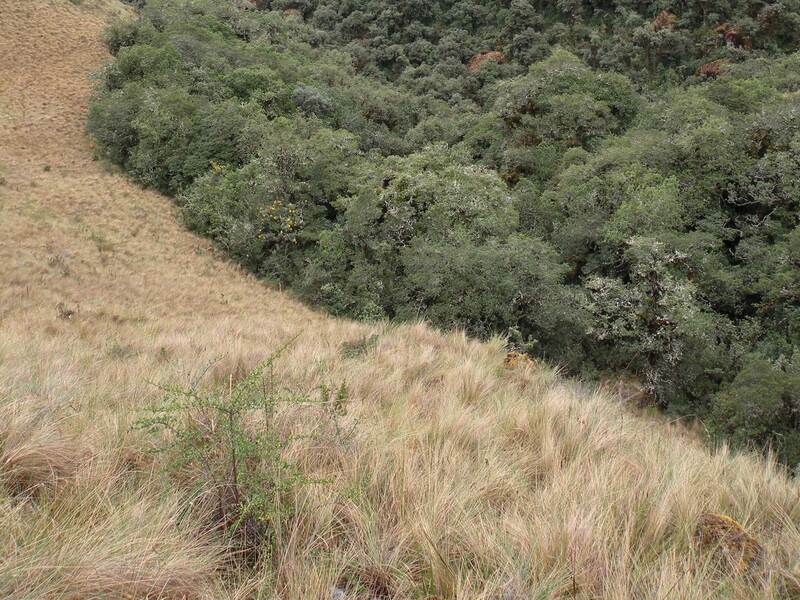 Cloudforest species will continue to shift their disruptions upslope. They will be unable to invade the puna. They will suffer decreases in their population sizes. They will be at danger of extinction. All bad news, right? Well there is one result from the Lutz et al. study that may be the silver lining on an otherwise very dark cloud. When Lutz et al. compared the rates of movement of the treelines in the protected areas of Manu National Park to the rates of movement of the treelines in unprotected areas outside the park, they found that protected treelines migrated upslope 5 times faster than their unprotected counterparts (0.24 vs. 0.05 vertical meters per year). The rate of migration in the park is still way too slow, but this difference does indicate that parks and protection work. If we could make the parks better park (e.g, remove cattle and stop fires) and make the parks bigger, then at least some Andean treelines might move faster and some extinctions may be avoided. *My grad student, Evan Rehm, is probably cringing at my use of the word ‘treeline’. I will leave it up to him to define the correct use of ‘treeline’ vs. ‘timberline’ vs. ‘tree species line’ and to better explain why the treeline or timberline is not shifting upslope faster in Manu. NPR is playing a new story about the effects of climate change on tropical forests featuring the work of KJ Feeley and his colleagues in the Andes Biodiversity and Ecosystem Research Group. One of the prima ry ways that climate change is predicted to affect the natural world is through changes in the geographic distributions of species. For example, increasing temperatures are expected to force species to ‘migrate’ to higher elevations and/or higher latitudes into areas that were previously too cold for them. Evidence has been rapidly accumulating showing the expected migrations of species in North America and Europe. In contrast, very few studies have documented species migrations of tropical species. This is despite the fact that tropics house the majority of earth’s species, that these tropical species are expected to be especially sensitive to climate change (due to greater specialization on stable climates), and that tropical species are known to have migrated in response to past climate change. In 2011, Feeley et al. published the first-ever study showing evidence of contemporary species migrations in tropical trees. Using data from repeated censuses of tree plots situated along a steep elevational gradient in the southern Peruvian Andes, they documented patterns of compositional change through time that were consistent with expectations of upward species migrations. Despite the strength of their findings, the question remained as to whether these results were driven by idiosyncratic factors such as land use change, succession or regional climate patterns, and thus specific to the study region, or if they reflect the effects of global warming and thus are more generalizable to the greater tropics. In a new paper, “Compositional shifts in Costa Rican forests due to climate-driven species migrations” Feeley show that forests in Volcan Barva, Costa Rica, are likewise showing strong evidence of upslope migrations. More specifically, Feeley et al. used herbarium collections data to characterize the ‘preferred’ temperatures or elevations of thousands of Costa Rican tree species. 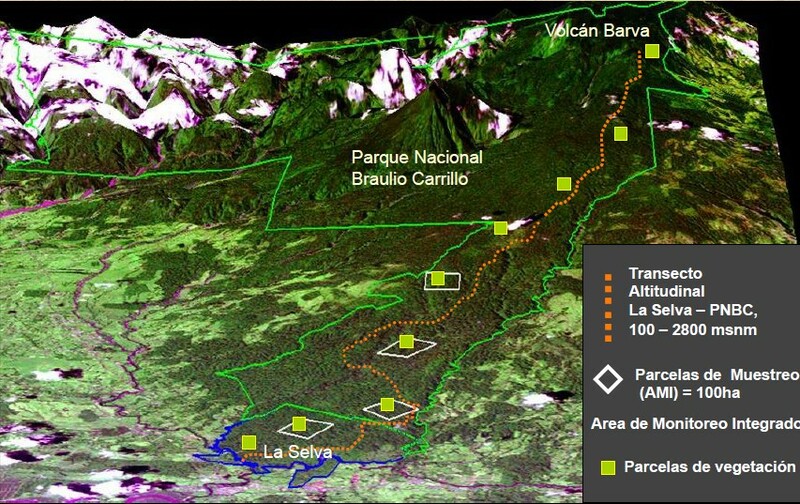 They then used the relative abundance of the different tree species in 10 1 ha tree plots established along the Volcan Barva to calculate each plot’s ‘Community Temperature Score’ or CTS. A plot has a high CTS has a high relative abundance of species with lowland affinities (i.e., species that prefer hot climates); in contrast a plot with a low CTS has a high relative abundance of species with highland affinities (i.e., species that prefer cold climates). Feeley et al. then tracked how the CTS of the Volcan Barva plots changed during the course of 10 years of annual plot censuses. Mirroring their results from the Andes, Feeley et al. 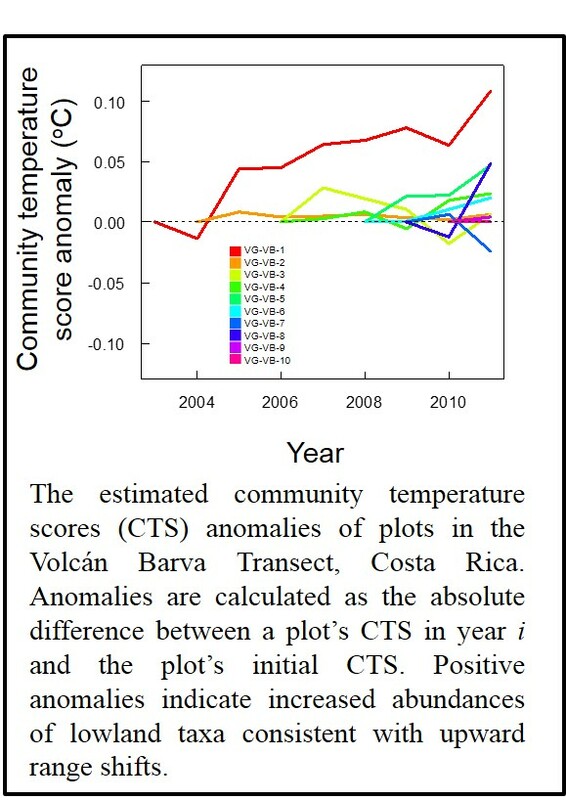 found that nearly all of the Costa Rican plots had increasing CTS. This means that the relative abundance of lowland species in the plots increased through time – exactly as predicted under climate-drive upward species migrations. The fact that the two studies by Feeley et al. (2011 and 2013) show such similar results despite a separation of thousands of kilometers, zero overlap in species, and different methods and personnel being used to collect and analyze the data, strongly suggests that species migrations are a general phenomenon in tropical forests and thus that the most likely explanation is a large-scale driver such as global warming. A very important, and often overlooked, consideration is that apparent species migrations can be driven by several different processes including “range skew” (i.e., no movement along the species’ trailing or leading edges but a shift in the relative abundance of individuals at different elevations within the range), “range shifts” (i.e., the leading and trailing edges of the species’ distribution migrate at the same pace), “range expansion” (i.e., the leading edge moves faster than trailing edge), or “range contraction” (i.e., the leading edge moves slower than the trailing edge). Depending on which of these processes is occurring, predictions for the future of ‘migrating species’ will vary from positive (under range expansions), to neutral (under range shifts) to dire (under range contractions). Most studies, including Feeley et al. 2011, only look at changes in the mean elevation/temperature of species and/or changes in the overall relative abundance of species at a site, making it impossible to distinguish between the four possible underlying processes. In their new analysis of Costa Rican forests, Feeley et al. 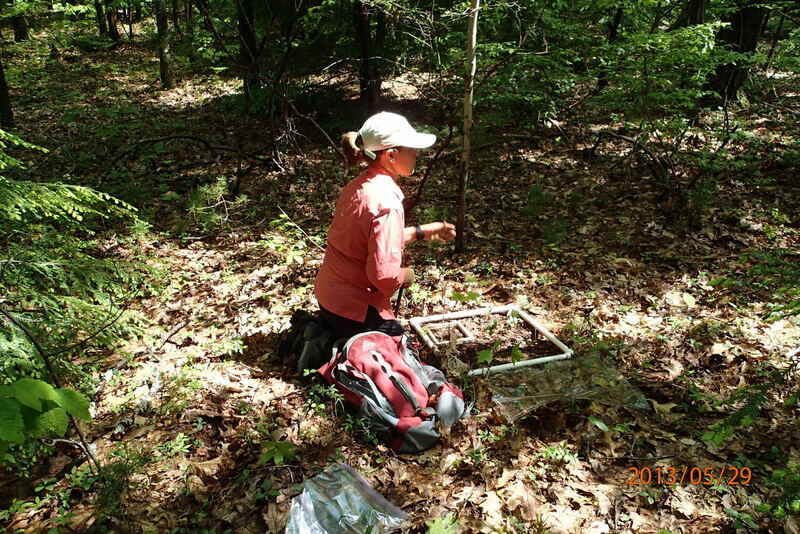 go the extra step and determine the individual contributions of tree mortality, recruitment and growth to the observed changes in the species composition of the study plots. They find that most of the observed changes are driven by mortality. In other words, the plots are increasing in their relative abundance of lowland species but this is actually due to the dieback of highland species rather than the encroachment of lowland species. This suggests that the compositional shifts are driven by range contractions. If range contractions continue in the future it will spell trouble for these species, and if generalizable it will spell trouble for tropical, and hence global, biodiversity.